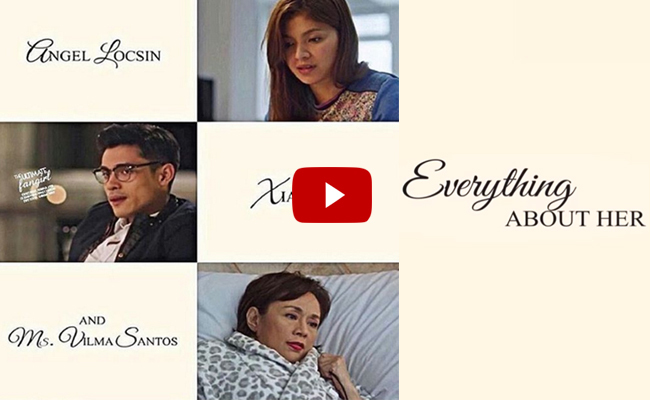 Star Cinema finally released the trailer of one of the most anticipated movie this 2016 “Everything About Her”. It was top billed by the one and only star for all seasons and Batangas Governor Ms. Vilma Santos, award-winning actress Angel Locsin and one of hottest leading man Xian Lim. In this movie, Vilma plays a strict CEO and a powerful woman but her world will turn upside down when she knew at her check up that she is suffering cancer and she will be taken care by a nurse that will be played by Angel. She gave a task to Angel to convince her son Albert who is going to be played by Xian, to live with her while he is still in the country. Angel is doing everything to convince him while Xian has an aloof relationship with her mother. Vilma did not tell her son about her condition while she is suffering inside. Angel’s character also had personal struggle where her own mother left them. She is also very patient in taking care of Vilma’s illness. This movie is directed by one of the best directors in our country, Bb. Joyce Bernal. This will be the very first time that Bernal will direct the three actors and she even became emotional at their story conference when she knew that she will direct them. Last November 2014, Vilma confirmed that she is going to have a movie with Angel. Her son and boyfriend of Angel, Luis Manzano, was supposed to star with them but he opted not to accept it for their relationship. Angel on the other hand was suppose to star in a movie version of “Darna” but it did not push through for she suffered an injury on her spine while preparing for the movie. The movie is set to release this January 27.